He plotted out the piecing diagram by himself, and then did a good job sewing it together. I quilted it a while back and decided to finish it up. One mistake--he wanted me to use black thread on the green part and green thread on the black part--but there was a miscommunication on that. Next time we collaborate I'll make sure I clear the thread choices with him before quilting! Jan asked me to quilt up this vintage quilt top for her a while back. (Actually before we moved away from Kansas.) I can't remember the details of where she got it but it's pretty cool. The navy blues, reds, and small calicoes remind me of being a little kid and hanging out with my Grandma. It's a generous twin size, and parts of it aren't exactly flat, so it's a bit of a challenge to quilt, but I'm making good progress. I decided to try out a different batting (Hobbes 80/20) than what I normally use and I like the extra loft. 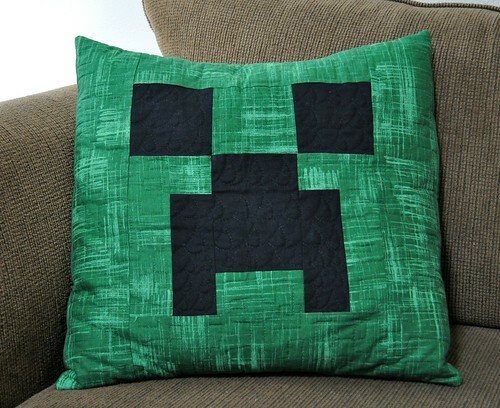 That creeper pillow makes me smile. Whenever my kids open a 2-liter of soda, they say that there are creepers in the house. 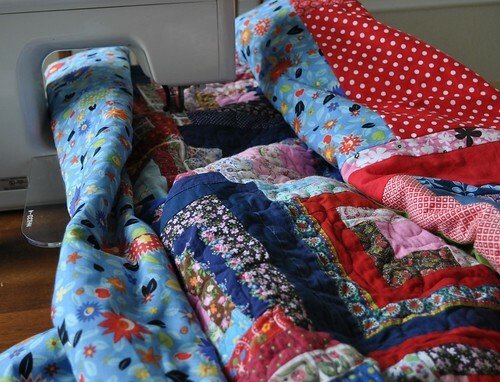 That vintage quilt is really pretty. I'm working on a quilting project for a friend right now too. She's a quilter (long story on how I ended up quilting for her) and it is pretty intimidating. From what I can see, it looks like your quilting is beautiful as always and it sounds like you're enjoying it, so that is great! ooh, that pillow is the BOMB, hope your son loves it. I'm amazed at how well he did in the planning and piecing, way to go!!!! I'm going to show that to my grandson who is a Minecraft fan!